Ross County: The biggest ever! Two early second half goals gave ‘Well a 2-1 win over Ross County at Fir Park this afternoon. A good second half performance and early goals from James McFadden and John Sutton, his 19th of the season, set ‘Well up for another home win and three points to keep them tied with Aberdeen in second top spot. And although County pulled one back to make it a rather nervous finish, Stuart McCall’s men thoroughly deserved the three points. Prior to the game County boss Derek Adam had highlighted defensive weaknesses in the ‘Well set-up but the former Fir Park player seemed more intent in denying the home side space in the visitors penalty area with a pretty defensive game plan. In the first half that left the Motherwell players with plenty of time in possession in their own half but a bit restricted as they approached a packed County defence. For their part, the Dingwall side seldom tested Gunnar Nielsen’s goal until the final ten minutes – although amazingly Derek Adams claimed they had the best of the first half chances when Jordan Slew fired a shot wide of the post. In reality the best chances came at the other end the first after 30 minutes when Shaun Hutchison launched a long free kick into the penalty area. And when Iain Vigurs nod down fell in front of James McFadden he looked certain to score but his cute left foot lob found Mark Brown’s outstretched right hand to make a fine stop. The former Motherwell ‘keeper again denied McFadden the opener eight minutes later when the ‘Well striker tried to force Stevie Hammel’s cross inside the post but Brown spread himself to block the shot. Keith Lasley then came close with a flashing header from an Ainsworth cross but the County defence stood solid. That all changed in the second half, when within three minutes the Fir Park side grabbed the lead to finally open up the game. Stuart Carswell carried the ball across the box before laying it back to Vigurs who fired in a thundering 25 yard drive. Although Brown did well to beat the ball out, McFadden was following up to stroke the ball past the grounded ‘keeper to make it 1-0. Brown then prevented it becoming two nil pushing away another stinging drive from Vigurs after Hutchison had raced 50 yards upfield with the ball to set up the midfielder. The County ‘keeper looked less convincing when he spilled McFadden’s low shot from a well worked free kick. That was the last piece of action for Faddy as he was replaced by Craig Moore after 55 minutes. And the 19 year old striker made an immediate impact when he set up ‘Well’s second goal on the hour. Although his shot from the area swerved, Brown palmed it out to the waiting Sutton who couldn’t miss from 6 yards, although he did manage to find the net via the underside of the bar. Motherwell looked in control at that stage and the more likely to add another goal but in the 78th minute Ritchie Brittain came within inches of getting his side back into the game when he side stepped a couple of defenders before drilling his angled shot off the foot of the post with Nielsen beaten. The home side ignored that warning and with eight minutes remaining County pulled one back when Yann Songo’o wonderfully volleyed home Carey’s corner to set up a nervous end. As County pressed for an equaliser Slew and Arquin missed a couple of half chances but the game ended without Nielsen having to make a save and ‘Well playing it out for a sixth home win from their last 7 games. “It was a more nervous finish than it should have been. “Motherwell are a good side and flying high but it was two errors by our keeper that has given them their two goals. Mark Brown has taken responsibility and when your keeper plays the ball back straight to the opposition there is not much the other defenders can do. Motherwell’s biggest ever Matchday Magazine is on sale again when Ross County visit Fir Park tomorrow. We’ve joined last Wednesday’s match with Inverness along with the weekend’s clash in this bumper edition. But what is inside this incredible 100-page issue? The Fir Park gaffer looks back at the 3-3 draw with Hibs and what he expects from both Caley and County, in what is a huge week for the club. Skipper Lasley does the same, and warns of the threat posed by the Highland duo. 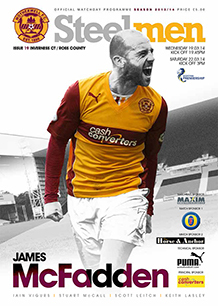 The feature interview is with Fir Park and Scotland legend James McFadden. The 30-year old talks about his role at Motherwell and how he is taking pride in helping nurture the clubs’ stars of the future. Faddy also features as the next in the centre-page souvenir poster collection. There is the usual extensive section dedicated to both our visitors, Inverness Caley Thistle and Ross County. As ever, Ray Morrison introduces both teams and there’s a player-by-player breakdown of who is likely to line up for Caley and County. We also report from Celtic Park as Inverness agonisingly lose the SPFL League Cup Final on penalties to Aberdeen, as well as County’s impressive 1-0 win at McDiarmid Park last Saturday. Graeme McGarry’s ‘Us and Them’ features former Inverness and Staggies midfielder Iain Vigurs. He chats about his ever-improving form and his time at both the Caledonian Stadium and Victoria Park. We are also fortunate to have respected journalist Charles Bannerman write an interesting feature on the rise of the Highland clubs in the last two decades. ‘From the Press Box’ returns with regular host, the Herald’s Scott Mullen and, for one time only (we promise! ), Press & Media Manager Alan Burrows also returns with ‘The Last Word’. That’s not all… Club director Graham Barnstaple introduces two new columns: The first is a review of some of our counterparts across the globe who share our famous and unique Claret and Amber colours. We kick off with the obvious; Bradford City AFC. His second is a review of some of the unique programmes throughout the last sixty plus years, starting with one of the first (in 1949), the Texaco Cup match against Spurs in the 1970’s and the first ever European programme against Katowice in 1991. Gavin McCafferty also took the time to catch up with Academy Director Scott Leitch, who outlines his vision and talks about his pleasure at watching the club succeed in recent years. We have another guest columnist too – the Bleacher Report blogger Paul Mullaney, a Queen’s Park far no less – who focuses on one of the SPFL’s most underrated talents, the man celebrating his Testimonial Dinner this week, Mr Keith Lasley. The second of the Eggheads Semi Finals pits Simon Ramsden against Stuart Carswell for the right to face James McFadden in the Grand Final. We also have an update from Barcelona as CEO Leeeann Dempster takes in the European Club Association’S (ECA) 12th General Assembly. Our match reports section takes a look back at the 4-1 win over Hearts and the 3-3 draw with Hibs at Easter Road last time out. There’s also a detailed look at the Under 20s 4-3 thriller against Falkirk last week. As we’re combining the programme for the next two matches, this incredible issue is available for £5 and is will be on sale from the Club Shop as well as the usual sellers located in and around the ground pre-match. Stuart McCall knows it’ll be a much-changed Ross County side visiting Fir Park tomorrow, but wants ‘Well to focus on their own game. The Staggies may have as much as seven different faces from when the teams last met back in mid December. Those new players have sparked a mini resurgence in the Dingwall side, who have taken eighteen points since the turn of the year, as opposed to eleven in the first five months. But ‘Well have enjoyed some good home form of their own in that same time period and although McCall admits they’ve done some additional homework on County’s additions, he has challenged his side to go and set the pace. Speaking to the broadcast press, the Fir Park gaffer said: ” They did it last season and have done it again. They’ve brought some new players in and changed it completely. They’re one of the form sides since the turn of the year. “I saw them up at St Johnstone and they had seven different players to the team we played back in December. They’re strong, powerful and have goals in them. They’ve been going with two strikers of late and Derek says he see’s flaws in us defensively and I can see why he thinks that because we like to attack. If we can win 5-4, I’d take that any day. Referee for Saturday’s SPFL Premiership clash with Ross County at Fir Park will be the experienced Iain Brines. Iain will be handling his third ‘Well fixture of the current campaign. The other two certainly won’ live long in the memory, a 2-0 defeat at the Caledonian Stadium back in August and a 2-0 loss at Celtic Park a month later. The 46-year-old will need little introduction to many Scottish Football fans having been a top-flight official for well over a decade and amongst FIFA’s elite group for five years, He is now amongst the best and most respected in the league. An interesting aside is that it will be Iain’s first match in charge at Fir Park for over a year. His last appointment at the home of the Steelmen was back in February 2013, and it was one to savour; a 2-1 win over Champions Celtic thanks to goals from Chris Humphrey and Michael Higdon. That was one of four matches he handled during that campaign. The first was a 1-1 draw with St Johnstone in August 2012, Bob McHugh coming off the bench to level. The second was a 2-0 home defeat at the hands of Celtic – Gary Hooper opening the scoring before Adam Cummins scored an OG before being sent off in the second half. The other was the 2-1 away defeat at St Mirren Park days before Christmas. Saints raced into a 2-0 half-time lead and although McHugh reduced the deficit, ‘Well couldn’t force an equaliser. His overall record in charge of the Steelmen is a bit of a mix bag. Of the 38 games he has taken charge of over the years, Motherwell have won thirteen, draw six and lost nineteen. In those games, 125 players have seen yellow, 55 of which in claret and amber, while six have been sent for an early bath – Stevie Hammell (vs St Johnstone) and Adam Cummins (vs Celtic) last season. He will be assisted Alasdair Ross and Billy Baxter with Nick Walsh on fourth official duties. The referee observer is Gerry Evans and the SPFL Delegate is John Blackley. Extended highlights from Fir Park as first half goals from Lionel Ainsworth and John Sutton gave ‘Well a 2-0 win. Action pictures from tonight’s hard-fought 2-0 win over Inverness Caley Thistle at Fir Park. ‘Well boss Stuart McCall admitted his side can play better, but was happy to take all three points against Inverness tonight. The Steelmen were far from their best against a leg-weary Caley side, but first-half goals from Lionel Ainsworth and John Sutton secured the win. The Fir Park boss, celebrating his 150th game in charge, conceded his team weren’t firing on all cylinders, but was delighted with a vital three points. Speaking MFC TV, he said: “It’s one of the few times we’ve managed to win a game and not be at our best. “We always say that if we want to take anything in this league, we’ve got to be right at it, particularly against teams right in and around us. “We’ve scored two good goals but, other than that, there wasn’t much to shout about. The second half performance wasn’t good enough, we know that and the lads know that themselves.